Recently, I’ve been seriously craving a new cabbage dish! Cabbage is so easy to find, so cheap, and so easy to use. I love cabbage, and cabbage rolls have always intrigued me. Then I thought about all of the rolling and new techniques I’d have to learn on top of everything else I had to do the day I was developing this recipe… so I decided to just unstuff it! 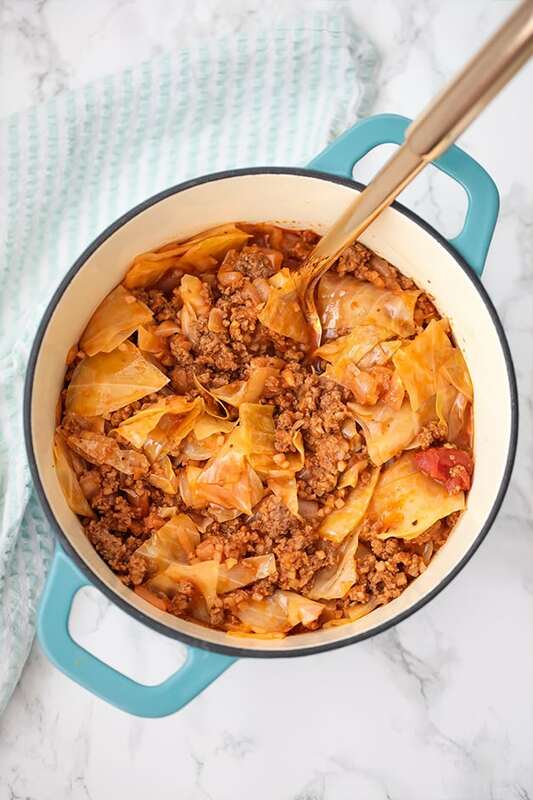 All of the flavor of cabbage rolls in one pot with this delicious one-pot unstuffed cabbage roll! The recipe is paleo, AIP, whole30 compliant, and has a lot of room for modification. You can make it with a tomato free sauce to keep it autoimmune protocol compliant, or you can go tomato crazy. Either way, it’s so easy and really inexpensive to make! You don’t need a fancy grocery store or crazy ingredients to make it. You can find everything you need easily, and cheap. I’m typically not a fan of most things that add an extra, unnecessary step. Yes, traditional cabbage rolls are fun, but do you really have to roll cabbage to get the cabbage roll experience? The answer is no! Not only is it easier than rolling cabbage by hand, it’s made entirely in one pot! No dirtying multiple pans or baking dishes. Cabbage has always been one of my favorite veggies to add more nutrient density at a great price. Plus, ground beef is one of the cheaper cuts of meat you can get. All around, it’s a cheap, easy, and nutrient dense meal! Cheaper than many other cuts of meat, and easy to find! Green cabbage chopped and cored is much easier than the traditional rolling in my opinion! Cabbage rolls typically have rice, but this dish uses cauliflower rice in its place. You can use a food processor to rice the cauliflower, or you can buy it pre-riced. Traditional flavors in cabbage rolls. I used a kettle and fire broth that I had on hand, but you can use homemade broth. I used a homemade nomato sauce as I’m intolerant to nightshades, but a good quality tomato sauce works if you can tolerate it. This one pot cabbage roll is the perfect weeknight meal! Using a large dutch oven, brown the ground beef on medium heat. Remove the beef and set aside, reserving the fat in the pan. Place the lid over the dutch oven and simmer for 15 minutes to allow cabbage to soften and flavors to incorporate. Remove the dish from the heat and serve warm. All nutrition facts are estimations. Easy, delicious and so perfect for meal prep! Make a big batch over the weekend and have meals prepped for a few days. Enjoy! This was easy and made a lot. The whole family liked it. Thanks! What a great recipe! I was starving and just happened to have a frozen quart size bag of nomato sauce, a frozen bag of riced cauliflower, ground beef and a head of cabbage. I also added a splash of apple cider vinegar and some sauerkraut to give the flavor a little zing. This will add some variety to my list of AIP dinner recipes. Thank you! Yum! Thanks so much Krysti!